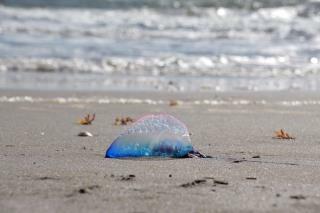 (Newser) – The official word from one expert: A "hell of a lot" of people have been stung by jellyfish lately on Queensland's Gold and Sunshine coasts in Australia. Over the weekend alone, more than 5,000 people were stung as weather drove an armada of bluebottle jellyfish toward shore, the Guardian reports. And between Dec. 1 and Jan. 7, 22,282 people were stung across Queensland—compared to 6,831 during that same period the year prior. The aforementioned expert notes that typically, just 25,000 to 45,000 people are stung over the course of an entire year in all of Australia. I HATE jellyfish. Many years ago I used to go to my aunt's summer house in the Rockaways and this one particular summer the ocean was filled with the clear ones and those ugly Portuguese man o' war types. The whole effing summer. Yuck.